Just popping in to share some new e-Reader sleeves I made yesterday, with the tutorial I wrote over at Craft Buds. These are custom orders, and I'm loving the fabrics my friend picked out! The smaller size pictured fits an iPad, and the larger size fits a manilla file folder, or perhaps a laptop. 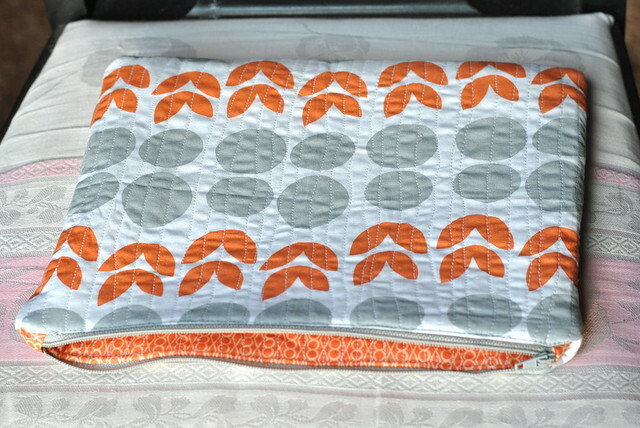 I quilted the smaller cover with wavy lines (both exterior and interior) and the larger zipper pouch has straight line quilting, which echoes the simple patchwork front. 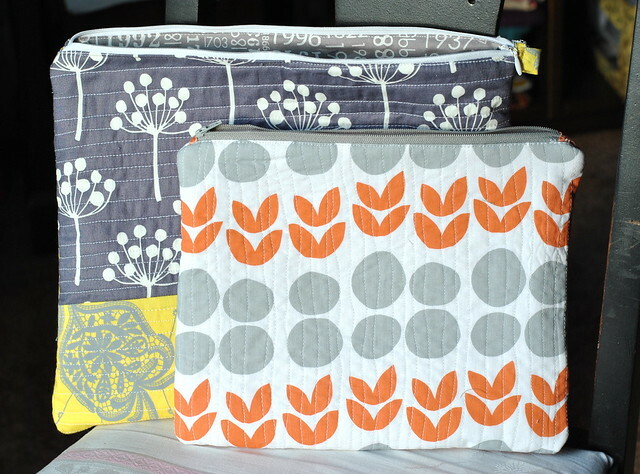 The fabrics are from Lotta Jansdotter (Echo and Bella) and Amy Butler (the yellow print is from Lark). Check out the free e-Reader sleeve sewing pattern if you'd like to make your own! Mixed Media Artist: Sometimes the design process can be painful! Cyndi decides to share some of her recent mistakes. How to Make Bread Dough Clay Holly Leaf Christmas Ornaments: Bread dough clay is fun for kids of all ages. What a great project for a wintry snow day! CD Scrapbook Ornaments: Cherie makes ornaments out of old CDs and scrapbooking supplies. ACreativeDream: Ornaments, ornaments, ornaments! Fifteen of them in 15 days... and plenty of them you can get finished in time for THIS Christmas! Crafty Princess Diaries: Get into the holiday spirit and get some great crafting and gift giving ideas from two books created by the folks at Country Living magazine. Craftside-A behind-the-scenes peek at our crafty world: This week at Craftside there are tutorials on how to fold an origami gift box, make a recycled t-shirt wreath, create a comic with found text, some deer themed logos to inspire different drawing styles, and 6 tips for choosing healthy foods. I love the fabric selections too!! May just need to make one of these for the iPad:).